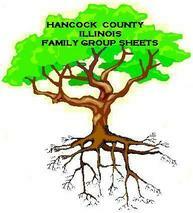 Family Group Sheets with Hancock County connections are always welcome. Send your Family Group Sheets and I'll post them on the website. Copy and Paste the text below into a text editor such as WordPad. Fill in the appropriate information. Save it as a text document. Send an email to Ken Huffman with file attached. Send family group sheets directly from your Family Tree Maker program. them to an email addressed to Ken Huffman.